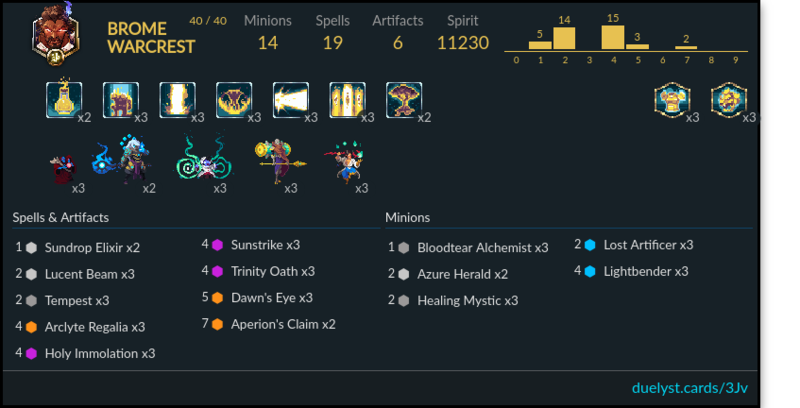 This has been my personal favorite deck and go-to climbing deck, consistently able to get me to the very top of the ladder(1-10) during all meta for nearly these two years past I’ve been playing. However, it is not a tournament deck as artifact can be easily tech-ed against. Also, It is not the best deck around, never quite able to outperform the strongest 2~3 decks in every meta. The best time to whip this out is when you are seeing a lot of aggro/burn/control lists on the ladder. The basic game plan is as following: litter some 2 drops down early game. Burn and control with Lyonar’s powerful AOE mid game, while equipping artifacts whenever you can afford to(and enemy cannot remove). Burn and smorc late game, clear a path to victory with Aperions’s claim. While Dawn Eye and Regelia are crazy together, they are good enough value alone so don’t worry not being able to have both equipped.